This striking micro macrame design is simple in conception, but needs a bit of practice to master. Necklace and Earrings nicely match the "Fans Bracelet". Recommended Skill Level: Intermediate (some knotting and beading experience helpful). This design primarily uses Double Half-Hitch knots with Lark's Head knots at the beginning and ending. The trickiest parts are beginning, ending, and determining how many seed beads to use per strand. It is all covered in the instructions with plenty of photos. The instructions and materials lists are written for the "Two Tone" version (see earrings on right side of photo above), but a tip is provided under "Variations" (at end of pattern) on how to do the "Speckled" version (see necklace and earrings on left side of photo above). Also under "Variations" are suggestions for varying the "tail" or "drop" segments. I provide continued support and will be happy to answer any questions you may have. Find answers and post questions here on this website. Just click on "Patterns" under "Categories" in the sidebar. 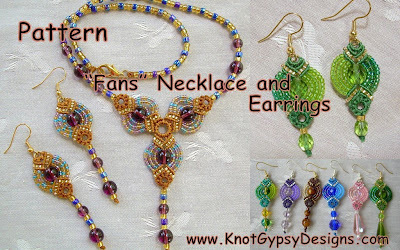 Scroll to this "Fans Necklace and Earrings Pattern" listing to find or post applicable comments. Or, you may contact me (see my profile). I am trying to make my patterns available on this website and for customers to be able to be directed to download immediately upon payment - rather than waiting for me to email the pattern to them. So, I am offering this NEW improved FANS Necklace and Earrings pattern for $1.00 during the testing phase. To participate, just click on the "Buy Now" button and proceed. If you are not directed to where you can download the pattern, please contact me (see profile) and I will email you the pattern. Either way, you get the pattern. Edit: Testing is now over. The new system seems to work and so I will be working to install it here. Thanks everyone for your help. Find "Basic Knots and Helpful Hints" here. I am working on a revised "Materials" document that integrates everything. Hopefully I will have it done in the next week or so. Until then, check out "Materials and Sources" under "Categories" in the sidebar for information on materials used.